A report on Food Security published by the Environment, Food and Rural Affairs (EFRA) Committee today supports Environment Secretary Owen Paterson’s plan to push ahead with growing genetically modified (GM) crops in England, but is silent on the crops that would actually be grown (1). The Committee says that the Government should do more to inform the public about “potentially beneficial impacts” of GM crops under development, but fails to inform the public that the commercial GM crops that would actually be grown commercially are tolerant to companies’ own-brand weedkillers, such as Monsanto’s RoundUp Ready crops. These herbicide-tolerant crops are not mentioned in the report, which also ignores evidence that non-GM farming in Europe has outperformed GM farming in the USA (2). “RoundUp Ready GM crops are the crops which could be grown in England perhaps as early as next year” said Dr Helen Wallace, Director of GeneWatch UK “Blanket spraying of these crops with weedkiller would lead to massive loss of habitat for birds and butterflies and a plague of superweeds for farmers. The costs of segregating GM and non-GM would push up food prices for everyone, and non-GM farmers would lose out financially if their conventional or organic crops become contaminated”. Monsanto’s or Syngenta’s RoundUp Ready GM maize (NK603 and GA21), which are blanket sprayed with the weedkiller glyphosate (brand name RoundUp), are in the commercial pipeline for EU cultivation approvals and their risk assessments have been finalized (3). Monsanto has stated it will withdraw crops from the pipeline but it has yet to do so for this crop. The other crops in the EU pipeline (pest-resistant Bt crops) are not suitable for growing in Britain. 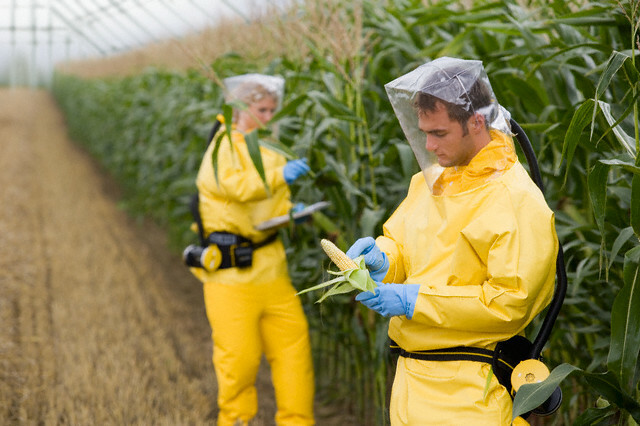 Experimental GM crops, such as those discussed in the Committee’s report, have a very high failure rate and are in any case decades from commercial use. Known environmental harms caused by RoundUp Ready GM crops include the growth of herbicide-tolerant superweeds and the loss of habitat for birds and butterflies: leading, for example, to a crash in the population of the iconic Monarch butterfly in the United States (4, 5). In the UK, there are no national measures for co-existence of GM and non-GM crops and for liability for the costs of contamination incidents, which can cost conventional and organic farmers many millions of pounds in lost markets for their products (6). The EU “opt out” proposal, which was adopted by EU ministers in June and will now go to the European Parliament, is intended to speed up GM crop approvals whilst allowing the countries opposed to growing them to opt out by imposing regional bans on the cultivation of specific crops. Scotland and Wales will opt out from growing GM crops, but the Government wants England to press ahead. Paterson has worked closely with the GM industry on UK policy, including on a PR strategy which seeks to avoid discussion of RoundUp Ready crops and the multinational companies that sell them (7). The Committee’s report also recommends that Government reduces dependence on imported soybean for animal feed, warning that increased demand for protein from emerging economies threatens current supply lines. Much of this imported soya is GM. The Committee also recommends that the UK takes steps to become more self-sufficient in fruit and vegetables, supermarkets shorten their supply chains to support more local food; and better long-term weather prediction for farmers is developed. Precision farming technology is highlighted in the report as one of the most promising ways to reduce food losses and increase yields. “It is a pity that these valuable recommendations on food security are likely to be drowned out by this Committee’s misleading claims on GM crops” said Dr Wallace. “Reducing dependency on imported GM soya, used to feed animals in Britain, would be a big step forward in making our food supply more sustainable and secure”. (4) For superweeds see: Benbrook CM (2012) Impacts of genetically engineered crops on pesticide use in the U.S. – the first sixteen years. Environmental Sciences Europe 24(1):24. www.enveurope.com/content/24/1/24 ; BBC report 19th September 2012: www.bbc.co.uk/news/science-environment-19585341 ; GM crops: Farmer to Farmer:gmcropsfarmertofarmer.com/ ; Greenpeace “Growing Doubt” video, October 2012:www.greenpeace.org/international/en/campaigns/agriculture/problem/genetic-engineering/Growing-Doubt/ ; more videos of superweeds on: www.gmfreeze.org/why-freeze/videos-and-clips/ .